Michael D. Kresh is the President and Chief Investment Officer of M.D. Kresh Financial Services, Inc. A nationally known expert in the area of retirement and investment planning services, Michael has been featured on national television programs and networks such as CNBC's Power Lunch, NBC's Nightly News, Bloomberg TV, MSNBC and the CBS Evening News. He has also been frequently quoted in newspapers including The Wall Street Journal, The New York Times, Newsday, The New York Daily News, as well as BusinessWeek, Worth, Kiplinger's and Fortune magazines. In addition to being a Certified Financial PlannerÂ® professional, Michael holds a Chartered Life Underwriter designation and has received the prestigious Dalbar Financial Professional Seal, awarded to an elite group of planners who placed highest in client trust, service, and investment performance according to Dalbar's extensive national research. 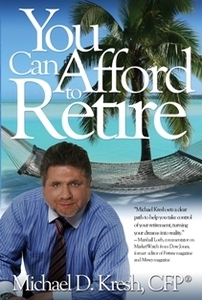 To learn more about Michael, please visit his websites at www.mdkresh.com and www.youcanaffordtoretire.com.